These sequences are functionally identified as members of the adenylate cyclase family, which catalyses the conversion of ATP to 3',5'-cyclic AMP and pyrophosphate. Six distinct non-homologous classes of AC have been identified. 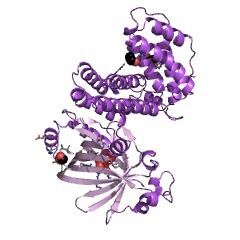 The structure of three classes of adenylyl cyclases have been solved ((PUBMED:16905149)). 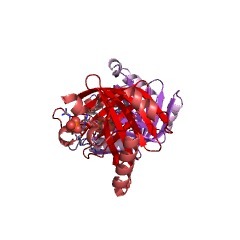 The entry represents the CYTH domain. 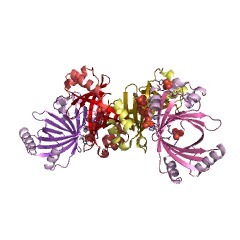 The bacterial CyaB like adenylyl cyclase and the mammalian thiamine triphosphatases (ThTPases) define a superfamily of catalytic domains called the CYTH (CyaB, thiamine triphosphatase) domain that is present in all three superkingdoms of life [(PUBMED:22984449)]. 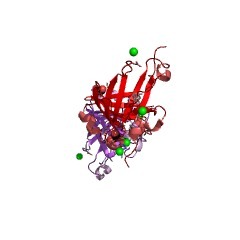 Proteins containing this domain act on triphosphorylated substrates and require at least one divalent metal cation for catalysis [(PUBMED:24021036)]. 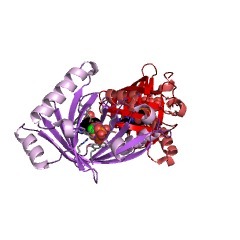 The catalytic core of the CYTH domain is predicted to contain an alpha+beta scaffold with 6 conserved beta-strands and 6 conserved alpha-helices. The CYTH domains contains several nearly universally conserved charged residues that are likely to form the active site. The most prominent of these are an EXEXK motif associated with strand-1 of the domain, two basic residues in helix-2, a K at the end of strand 3, an E in strand 4, a basic residue in helix-4, a D at the end of strand 5 and two acidic residues (typically glutamates) in strand 6. The presence of around 6 conserved acidic positions in the majority of the CYTH domains suggests that it coordinates two divalent metal ions. 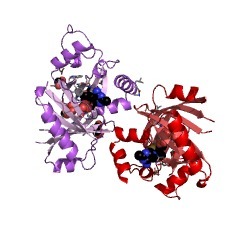 Both CyaB and ThTPase have been shown to require Mg(2+) ions for their nucleotide cyclase and phosphatase activities. 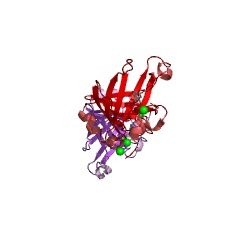 The four conserved basic residues in the CYTH domain are most probably involved in the binding of acidic phosphate moieties of their substrates. The conservation of these two sets of residues in the majority of CYTH domains suggests that most members of this group are likely to possess an activity dependent on two metal ions, with a preference for nucleotides or related phosphate-moiety -bearing substrates. 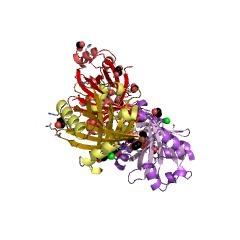 The proposed biochemical activity, and the arrangement of predicted strands in the primary structure of the CYTH domain imply that they may adopt a barrel or sandwich- like configuration, with metal ions and the substrates bound in the central cavity [(PUBMED:12456267)]. There are 17696 CYTH domains in 17691 proteins in SMART's nrdb database. Taxonomic distribution of proteins containing CYTH domain. This tree includes only several representative species. The complete taxonomic breakdown of all proteins with CYTH domain is also avaliable. Click on the protein counts, or double click on taxonomic names to display all proteins containing CYTH domain in the selected taxonomic class. 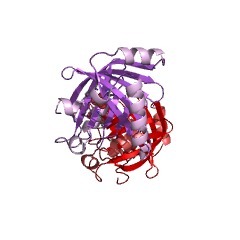 Structure of the class IV adenylyl cyclase reveals a novel fold. 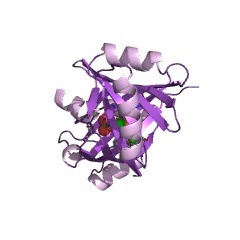 The crystal structure of the class IV adenylyl cyclase (AC) from Yersinia pestis (Yp) is reported at 1.9 A resolution. The class IV AC fold is distinct from thepreviously described folds for class II and class III ACs. 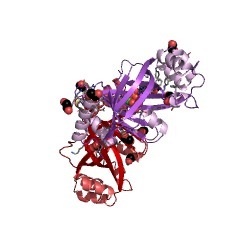 The dimeric AC-IVfolds into an antiparallel eight-stranded barrel whose connectivity has been seenin only three previous structures: yeast RNA triphosphatase and two proteins ofunknown function from Pyrococcus furiosus and Vibrio parahaemolyticus. Eighthighly conserved ionic residues E10, E12, K14, R63, K76, K111, D126, and E136 liein the barrel core and form the likely binding sites for substrate and divalentcations. 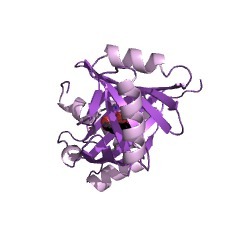 A phosphate ion is observed bound to R63, K76, K111, and R113 near thecenter of the conserved cluster. 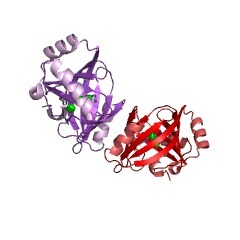 Unlike the AC-II and AC-III active sites thatutilize two-Asp motifs for cation binding, the AC-IV active site is relativelyenriched in glutamate and features an ExE motif as its most conserved element.Homologs of Y. pestis AC-IV, including human thiamine triphosphatase, span thethree kingdoms of life and delineate an ancient family of phosphonucleotideprocessing enzymes. Crystallization of the class IV adenylyl cyclase from Yersinia pestis. The class IV adenylyl cyclase from Yersinia pestis has been cloned andcrystallized in both a triclinic and an orthorhombic form. 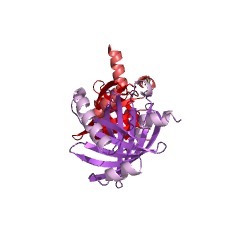 An amino-terminalHis-tagged construct, from which the tag was removed by thrombin, crystallized ina triclinic form diffracting to 1.9 A, with one dimer per asymmetric unit andunit-cell parameters a = 33.5, b = 35.5, c = 71.8 A, alpha = 88.7, beta = 82.5,gamma = 65.5 degrees. Several mutants of this construct crystallized butdiffracted poorly. A non-His-tagged native construct (179 amino acids, MW = 20.5 kDa) was purified by conventional chromatography and crystallized in space group P2(1)2(1)2(1). These crystals have unit-cell parameters a = 56.8, b = 118.6, c = 144.5 A, diffract to 3 A and probably have two dimers per asymmetric unit and VM = 3.0 A3 Da(-1). Both crystal forms appear to require pH below 5, complicatingattempts to incorporate nucleotide ligands into the structure. The nativeconstruct has been produced as a selenomethionine derivative and crystallized forphasing and structure determination. The catalytic domains of thiamine triphosphatase and CyaB-like adenylyl cyclasedefine a novel superfamily of domains that bind organic phosphates. 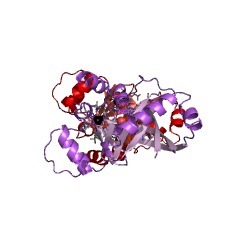 BACKGROUND: The CyaB protein from Aeromonas hydrophila has been shown to possess adenylyl cyclase activity. 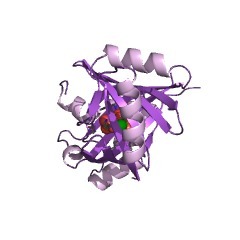 While orthologs of this enzyme have been found in somebacteria and archaea, it shows no detectable relationship to the classicalnucleotide cyclases. Furthermore, the actual biological functions of theseproteins are not clearly understood because they are also present in organisms inwhich there is no evidence for cyclic nucleotide signaling. 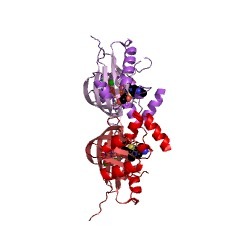 RESULTS: We show thatthe CyaB like adenylyl cyclase and the mammalian thiamine triphosphatases define a novel superfamily of catalytic domains called the CYTH domain that is presentin all three superkingdoms of life. 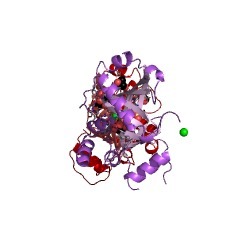 Using multiple alignments and secondarystructure predictions, we define the catalytic core of these enzymes to contain anovel alpha+beta scaffold with 6 conserved acidic residues and 4 basic residues. 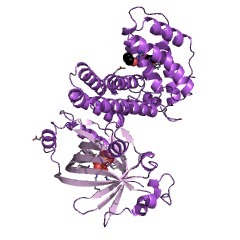 Using contextual information obtained from the analysis of gene neighborhoods anddomain fusions, we predict that members of this superfamily may play a centralrole in the interface between nucleotide and polyphosphate metabolism.Additionally, based on contextual information, we identify a novel domain (calledCHAD) that is predicted to functionally interact with the CYTH domain-containing enzymes in bacteria and archaea. 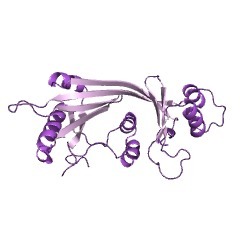 The CHAD is predicted to be an alpha helicaldomain, and contains conserved histidines that may be critical for its function. CONCLUSIONS: The phyletic distribution of the CYTH domain suggests that it is an ancient enzymatic domain that was present in the Last Universal Common Ancestorand was involved in nucleotide or organic phosphate metabolism. Based on theconservation of catalytic residues, we predict that CYTH domains are likely tochelate two divalent cations, and exhibit a reaction mechanism that is dependent on two metal ions, analogous to nucleotide cyclases, polymerases and certainphosphoesterases. Our analysis also suggests that the experimentallycharacterized members of this superfamily, namely adenylyl cyclase and thiaminetriphosphatase, are secondary derivatives of proteins that performed an ancientrole in polyphosphate and nucleotide metabolism. Aeromonas hydrophila adenylyl cyclase 2: a new class of adenylyl cyclases withthermophilic properties and sequence similarities to proteins fromhyperthermophilic archaebacteria. Complementation of an Escherichia coli cya mutant with a genomic library fromAeromonas hydrophila allowed isolation of clones containing two different cyagenes. Whereas one of these genes (cyaA) coded for an adenylyl cyclase (AC1)belonging to the previously described class I adenylyl cyclases (ACs), the secondone (cyaB) coded for a protein (AC2) that did not match any previouslycharacterized protein when compared to protein sequence databases. In particular,it did not align with any of members of the three known classes of ACs. Thepurified AC2 enzyme exhibited remarkable biochemical characteristics, namely, an optimum activity at a high temperature (65 degrees C) and at an alkalinic pH(9.5). In order to investigate the functions of both cyclases in A. hydrophila,each gene was inactivated in the chromosome and the resulting mutant strains wereexamined for physiological alterations. It was shown that, in contrast to cyaA,the cyaB gene was not expressed under usual laboratory growth conditions.However, introduction of a plasmid harboring the cyaB gene in a cyaA mutant, aswell as in a cyaA cyaB mutant, allowed cyclic AMP production. 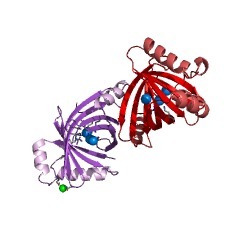 AC2 is the firstmember of a new class of previously unrecognized ACs, and to date, no functional counterpart has been demonstrated in other organisms. However, scanning databasesrevealed a significant similarity between AC2 and the gene product of threehyperthermophilic archaebacteria: Methanobacterium thermoautotrophicum,Archaeglobus fulgidus, and Methanococcus jannaschii. The possibility of a genetransfer between such phylogenetically divergent bacteria is discussed. 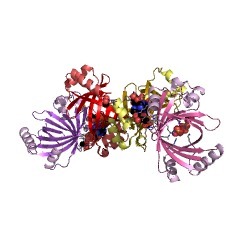 2aca X-ray structure of a putative adenylate cyclase Q87NV8 from Vibrio parahaemolyticus at the 2.25 A resolution. Northeast Structural Genomics Target VpR19.